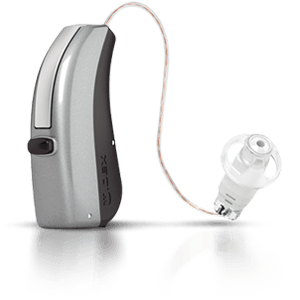 Hearing Aid Source Review: The Widex Beyond 440 is the latest flagship model from this Danish company. The Beyond platform offers the company’s first ever direct to iPhone streaming compatibility. Widex claims that their direct to iPhone hearing aid has a superior streaming sound quality as well as the most efficient battery consumption when compared to other direct to iPhone hearing aids. However after several discussions with Widex Audiological support, the technology difference between the Unique platform and the Beyond platform does not differ in any other way aside from the the MFi (Made for iPhone) wireless technology. That being said, we reviewed the Unique 440 model and gave it high marks for smooth and natural sound quality. We expect no change to sound quality based on Widex’s own admission that the entire hearing aid is essentially the same. There is a slight premium in cost when compared to the Unique 440 line but it is not significant, relatively speaking. When using these hearing aids outside, we experienced the very noticeable wind noise reduction. It was quite good at minimizing the turbulence of the microphones. This is a great feature for people who are active outdoors. All Widex Beyond hearing aids are rated at IP68 which is the highest current rating in terms of moisture and dust protection for hearing aids. We expect that the Widex Beyond models will be quite durable. The Widex App for iOS is easy to use and quite flexible in terms of making adjustments to the sound of the hearing aids. Click here to visit the Apple App Store. Android and other Bluetooth connections will be supported via the Com-DEX product, which is a neck worn streaming device. All DEX accessories will also be supported with this new iteration of product as well. Click here for more information about DEX Accessories. Our experience with the Widex Unique 440 with their SMARTWIND wind noise manager was incredible. All microphone turbulence was eliminated and speech comprehension in wind was excellent. We expect the same performance of the Beyond platform. Our analysis of the Beyond 440 Fusion achieved high ratings for all that it did during our trials, as such, we recommend and endorse this product for our Best In Class hearing aids list. To discover more about Widex and their offerings, click here to go to the Widex website. For more information about the Widex Beyond 440 or any other hearing aids we offer, don’t hesitate to contact us by phone or by email.